If you ever wondered "where are they now?" for that blond-haired kid actor from 1983's A Christmas Story, well, it ain't pretty. 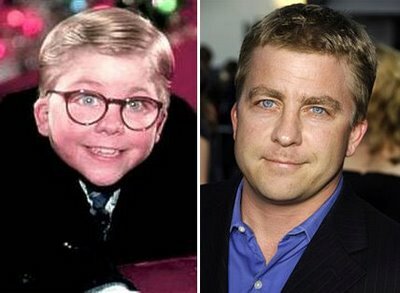 Peter Billingsley did executive produce the pretty-good Iron Man, but the rest of his work has been stinker city. Billingsley has built a close working relationship with the sometimes-great Vince Vaughn (Zoolander, Old School, Anchorman, Wedding Crashers, Into the Wild). Unfortunately, when Billingsley gets involved, things get awful for Vaughn. Case in point: the deplorable Four Christmases. And now an even lower low. I figured Couples Retreat would at least be watchable. 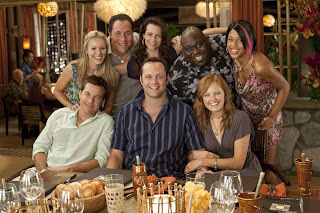 After all, it stars Vaughn, the almost-always-great Jason Bateman, Kristin Davis, and Jon Favreau. But this is a lifeless script that shows on the exasperated and bored actors' faces. There should be reasons to like the movie. It mostly takes place on a tropical island (actually Bora Bora, in French Polynesia) that is consistently Photoshop beautiful. There are wacky supporting actors that excel in New Age guruism, inappropriately sexual yoga positions, and creepily militaristic couples-therapy regimentationism. The thing is: these actors have very little humor to work with in the scripts, and it's painful to watch such terrible writing left to be impossibly fixed by the actors. Favreau and Vaughn would get a pass for at least some mildly entertaining moments. However, they were the writers (along with Dana Fox). So, with Vaughn in a serious rut over the past few years (although his box-office receipts have oddly never been better), it is going to take a seriously brilliant idea to redeem him to his once-excellent status of several years ago. And to top it all off, the movie's title is missing an apostrophe. Blech. no apostrophe necessary ... would "pants sandwich" need an apostrophe? No comparison. Pants can't be possessive like couples. Spoken like this could actually be Peter Billingsley, someone who might be a little possessive of the movie's title.